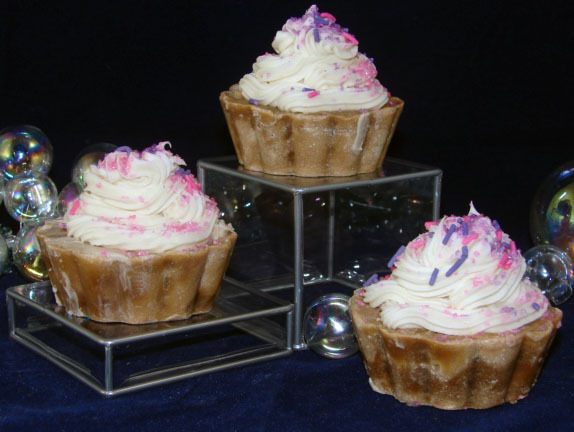 Goat milk soaps with essential oils enrich your skin while enhancing your mood with aromatherapy. Gran’ Nanny’s Goat Milk Soaps gourmet food-quality oils are added to our goat milk/lye mixture because they create creamy soaps that leave you with an extraordinarily smooth feeling. Our goat milk soaps with essential oils include: oils (olive, coconut, palm kernel, corn, castor); goat milk, lye, shea butter, essential oils, and natural coloring. Old Fashion Goat Milk Soap This unscented favorite is one of my most popular. Experience the true magic of goat milk proteins as they glide across your skin. Eucalyptus Energizer Excellent for all skin types. Eucalyptus is fresh, cooling and energizing; frequently used as a support to the respiratory system for cough and throat ointments. Peppermint Pick-Me-Up Peppermint cools and stimulates your spirits while it clears your mind, relieves tension, vitalizes and restores your senses, aids with acne and dermatitis. Clary Sage Soak Known as a relaxing, warming essential, Clary Sage eases nervous tension. Enjoy its nutty, herbaceous aroma as a gentle lather cleanses and nourishes your skin; aids with acne, oily skin, and wrinkles. Orange Delight Orange essential oil has a sweet, citrus fragrance that combats oily skin, soothes dry, irritated skin while lessening tension and tress. Cedarwood Soak Cedarwood relieves tension, soothes skin irritants, and acts as an astringent; has a warm, Camphoraceous top note and sweet tenacious, woody-balsamic undertone, aids acne, eczema, and oily skin. Lemon Poppy seed This light, fresh, citrus scent acts as an anti-septic, astringent,and an antitoxin. Vanilla Blend Sweet, uplifting allure of Vanilla, known for its honey-like scent, Vanilla can be soothing when rubbed into your skin – leaving it soft, smooth and clear. Sensual Flower allows you to indulge in the invigorating allure of Ylang-Ylang. Its floral aroma is exhilarating yet relaxing making it the perfect blend with rich goat milk soap. Available in two molds: Nubian Face or Nursing Doe; both sell for $5.00 each.